@has55 wrote: OG, have you notice any other reduction in specific insect pest or disease besides powdery mildew since you started applying compost tea? How long have you been applying compost tea? I did not put down any compost tea or compost this year and noticed a significant attack of disease on my cucumbers and watermelons. They were wipe out. I was able to save the peppers with actinovate organic fungicide. Last year I had a great abundance of food. I'm starting the compost tea prep for the fall and winter garden hopefully later on this week. Too many projects, here and on the new business adventure in staffing healthcare. 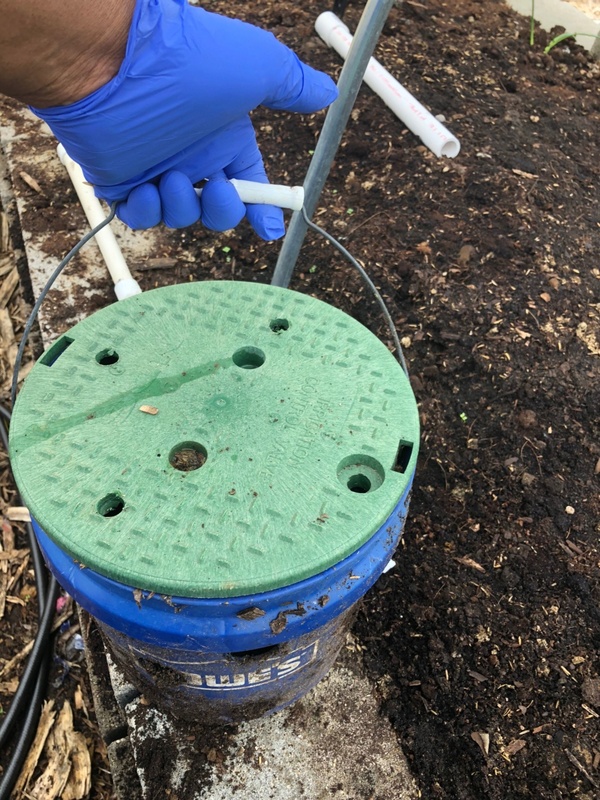 I have been using compost since the 70's, but have only been using compost tea for about 3 years. This year is the first time I have used foliar spray, having only used soil drenching up until recently. We were gone for month-long road trip mid-summer to see our first grandbaby, and when we returned home in mid-July the gardens were a mess. Lots of damage to plants from flea beetles, cucumber beetles, and cabbage worms. I remembered some videos I had watched on growing your greens youtube about compost tea and decided to research it. At that time I just had a 5 gallon bucket with an air stone for a tea brewer, but I made batch of tea and did a foliar spray with it. A week later I repeated the process, and I noticed a dramatic decrease in the number of flea beetles and squash powdery mildew. Most of the cucumbers were pretty much destroyed when we got home, and I had already removed the plants. I have since built a new and more effective 15 gallon tea brewer, and have continued the foliar spray every two weeks. The growth and production of the vegetables since then has been amazing. 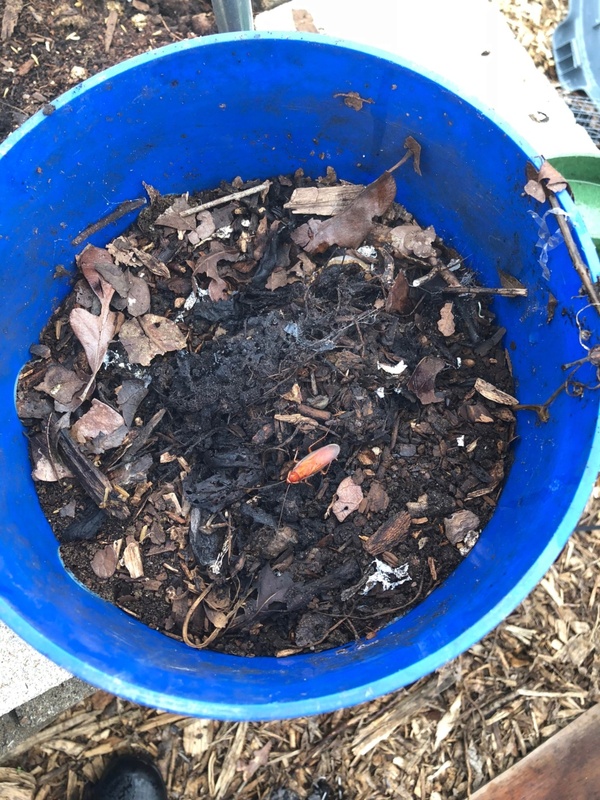 I am making the compost tea with worm castings, molasses, kelp, and fish fertilizer. 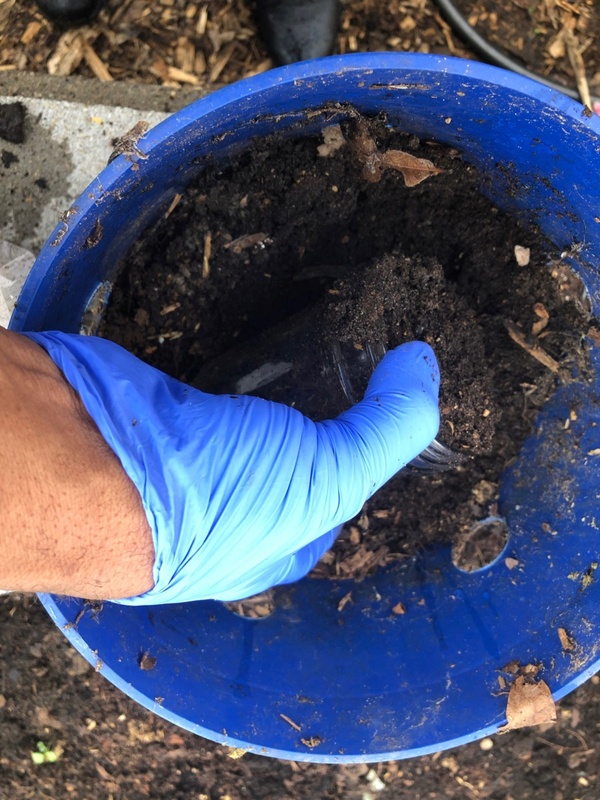 I decided to use worm castings rather than my own compost to make the tea so that it might add different microbes than I already have. put the items together yesterday. Will put tea on the beds today. 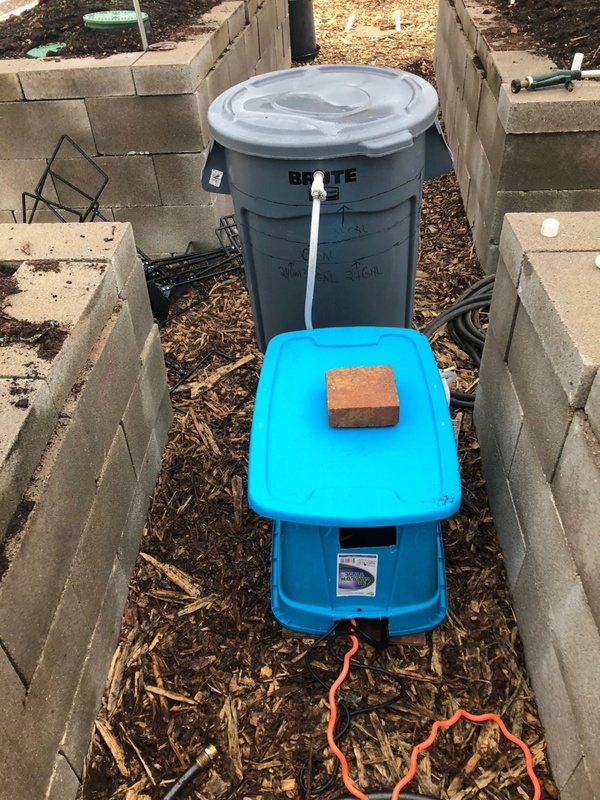 compost tea setup. The brewing is on. Looking good, Has55! I noticed you have the air pump sitting on the ground - I put mine up higher than the brewer so there is no chance of the water running backwards in the tube and into the pump in case the electric power goes off, is that a concern? I have another batch brewing, and about ready to go into the gardens. Has55, is that the 2 gal Lowe's bucket or a 5 gallon, looks short, so assuming the 2G. 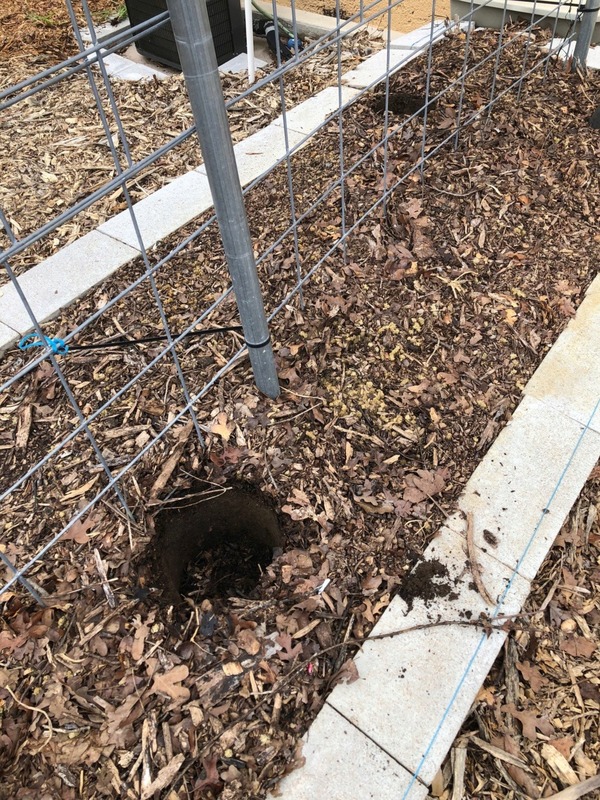 Did you screen in the holes or just leave the big holes open for easy critter access? Or basically is it just a 2G pail with a bunch of 2 inch holes drilled in it, stuffed in the ground and covered with a 10 inch irrigation cover? I need to migrate to these as every summer I have huge die offs in my vermicompost towers during the heat waves. Did you screen in the holes or just leave the big holes open for easy critter access? HOLES ARE OPEN. Or basically is it just a 2G pail with a bunch of 2 inch holes drilled in it, stuffed in the ground and covered with a 10 inch irrigation cover? YES, YOU HIT THE NAIL ON THE HEAD. This way they can get away in the summer or winter. Easy in or easy out. they are working quite well in all the beds. you can easily see the contents and put your hand in to harvest. I love the ones in the waist high beds because I don't have to bend over to feed them. easy for transport too. I fill the containers to the top, the worms are able to handle it. My husband told me to to make sure that I set the air pump higher than the bucket to prevent tea from being siphoned back into the pump. Just a precaution. 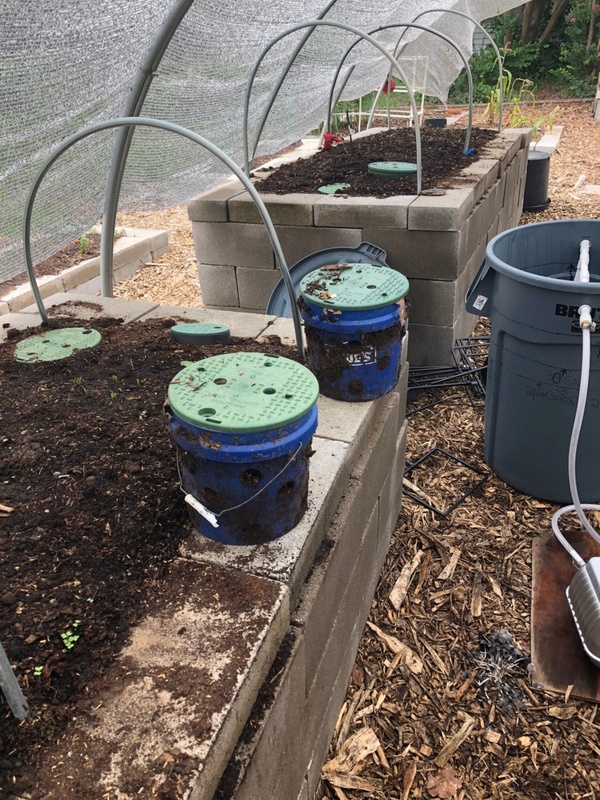 I expect the reason for keeping the pump higher is to prevent siphoning of the compost tea out of the bucket if the pump stops working. 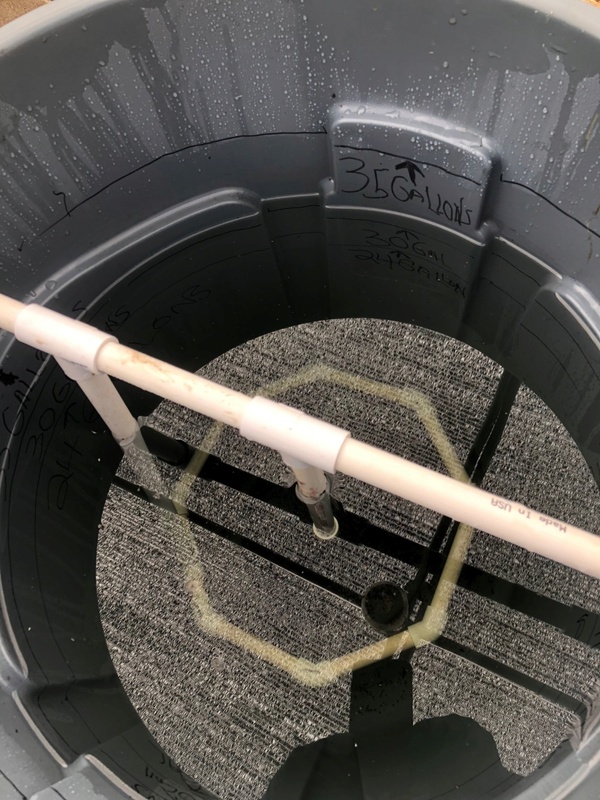 I need to get a heater that I can put in my 10-gallon Compost Tea Brewer in order to heat the well water to the 65° to 70° temperature range. Anyone with experience with doing this that can recommend the best type of heater? the heater prices are fair. 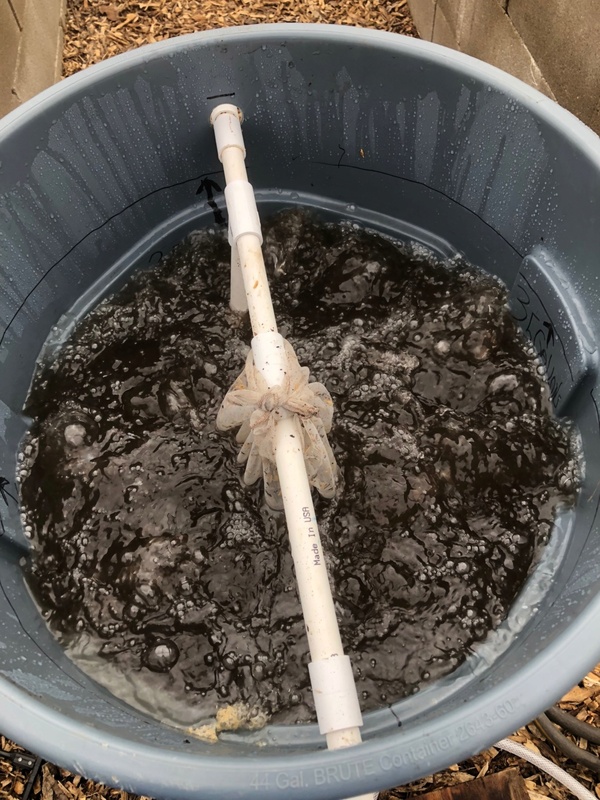 Compost tea does best at 65-70*F? I never thought of the temperature. Summers reach in the 100s here. For a ten gallon setup those are too big. A 10-20 gal setup that is intended to heat about 10 degrees above ambient average room temp should only take about 50W heater. A ten gallon can often do a 25w heater. If you have a resevoir and bubbler and not sprayers, smaller may work better. Bigger isn't better as its like trying to simmmer on the stove by flipping the burner between max and off. If the well water is coming out closer to 52F you might be better let it sit to warm up. Even then a 50W should be fine as after initial heat, it just needs to maintain ambiant air heat loss.